Dolphin Data Lab keep releasing new data recovery solutions for all Dolphin users for their high data recovery success rate, specially from firmware and head damaged hard drives. For head damaged hard drives, the very first solution people may think over is to swap the damaged or weak heads, but if without head swap, can users get the lost data back? Now it is possible. 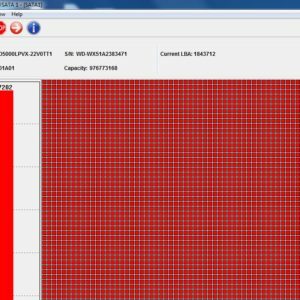 For many drives, the hard drives work very slowly and when trying the logical scan, there’re many delayed or even bad sectors. It is never possible to complete the image or extract the lost data. However, the drive was not clicking, that means the heads are not yet totally damaged or have shape changed. Dolphin recovery lab has got many cases like above, weak heads but not totally damaged and then recovered lost data fully without head swap. 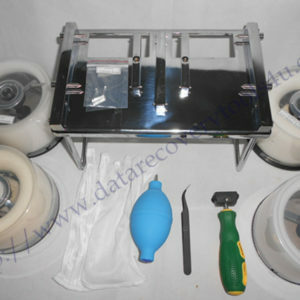 DFL HDD head temperature adjustment feature which built in Seagate firmware repair program can help us do disk imaging or data retrieval directly without replace the original weak head, it is very powerful, useful and convenient. First we take a look at this drive’s overall condition in DDP data recovery program. The head work very unstable, sometimes it takes a long time to get ready. After the drive is ready, we checked the basic status. There are a lot of bad sector in front part, and the scan speed is very slow. If fact, the middle and rear section works the same, the whole drive is full of bad sectors and come in serious bad condition. (We once tried to image this drive, since the image speed is too slow, we cannot expect the whole image to be completed within a week or even longer). Let us take a look the partition situation as well. Apparently, the head is very weak, it get stuck during the partition listing process. And the program keep reporting “sector error”, that means a lot of bad sector existing in this drive. Since the upcoming new Seagate firmware repair program come with a head temperature adjustment feature, we tested this new added feature on this drive. This utility was built in the menu of premium– adaptive temperature adjustment- edit. The program can detect the read and write temperature of each head. In this case we added 20 in every zone of each head to see the performance. There is one thing worth mention, now we do not need to write ROM in new program, this change can be executed directly by just writing RAM. The benefit of this operation is we do not need to power off and on for the drive, but can image or extract data directly. Now let us check the scan performance again. The scan in front part got better, but not very well. We keep scanning, the situation went well and smoothly in other parts obviously. All partition can be listed out quickly, and all files can be read and opened as well. If we do disk imaging and extract data now, it definitely go much faster than before.